I love Chinese food. But I’m also spoiled when it comes to Chinese food, namely because my mom is da bomb in the kitchen and regularly threw down authentic, Chinese dinners. (Lion’s Head anyone?) We also had excellent Chinese restaurants where I grew up, and with frequent trips to Monterrey Park to pick up Char Siu Bao (BBQ pork buns), I grew up eating GOOD Chinese food. Even with that said, I could still appreciate Americanized Chinese food – to the point that many of my full Chinese friends would give me a hard time for liking Panda Express. All this is to say that I have a pretty good idea of what real Chinese food tastes like as well as what good American Chinese food tastes like. With all of this culinary expertise behind me, I was looking forward to try Wanchai Ferry frozen entrées, a new way to have a complete Chinese meal in the comfort of your own home, without having to deal with a Chinese food delivery man. Wanchai Ferry has 8 different entrées available, including Shrimp Lo Mein and Orange Chicken. 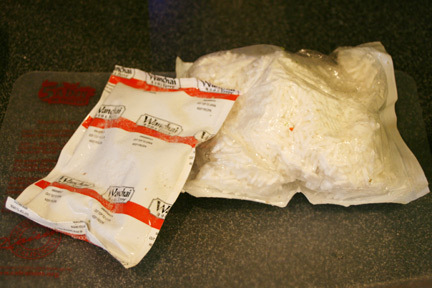 Each bag includes everything you’ll need for your Chinese inner, including the meats and veggies, rice, and sauce. 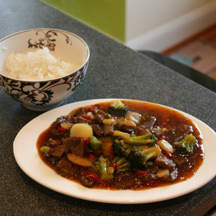 Their latest flavor, Beef & Broccoli, included generous amounts of broccoli, red peppers, and water chestnuts along with the beef strips, rice, and soy and garlic flavored brown sauce. 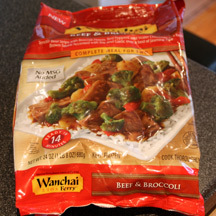 Cooking the Wanchai Ferry Beef & Broccoli meal was very easy and I was finished in under 10 minutes. First, I heated the beef and vegetables in a skillet with some water, allowing it to cook for ~8 minutes. Then I added the sauce and stir fried for another 2 minutes. Meanwhile, I put the bag of rice in the microwave and nuked for ~2 minutes. After everything was ready, I simply threw the rice into a bowl, put the Beef & Broccoli onto a serving dish and dinner was ready. I loved that it only required one dish to cook (the skillet) which makes clean-up a breeze. Wanchai Ferry frozen entrées are a convenient and quick way to have a yummy Asian style meal on the table in minutes. I plan on picking up some more using this coupon for $1.60 off. For more information about Wanchai Ferry, great meal tips (such as adding cashews or hoisin sauce for more exotic flavors) you can visit the Wanchai Ferry website at www.wanchaiferry.com. WiC Project Wanchai Ferry Giveaway! 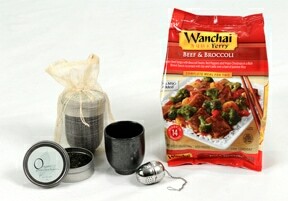 One winner will receive a Wanchai Ferry Prize Pack, which includes one VIP coupon for Wanchai Ferry and two tea sets. 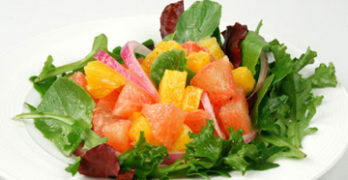 Visit www.wanchaiferry.com and let me know which Wanchai Ferry flavor you’d like to try the most. If you don’t see one you like, then let me know what Asian meal you would like Wanchai Ferry to add to their product line. Giveaway ends at 11:59 PM EST, July 13, 2010. Disclaimer: This post consists of my (and/or fellow tester) opinions only. No compensation was given for this review/giveaway. I did receive a free Wanchai Ferry gift pack and information from Wanchai Ferry through MyBlogSpark to use and test for the purposes of this review. This did not affect the outcome of this review. I'd love to have their Shrimp Lo Mein! I would like the Kung Pao chicken. Would love to try the orange chicken! Wow! That looks so good and sounds easier than burgers! I'm going to have to try these out soon! While Beef & Broccoli would be my first choice the Sweet and Sour Chicken sounds good too. Thanks for the chance. I'd like to try Szechuan Style Chicken. The Spicy Garlic Chicken sounds yummy. Spicy Garlic Chicken or Shrimp Lo Mein! Both sound yummy! seet and spicy shrimp or orange chicken look good to me! I want to try the Sweet and sour Chicken. I would try Orange Chicken first and I'd like to see General Tsao's Chicken. The Wanchai Ferry meal I would like to try most is Kung Pao Chicken…yum! 🙂 Thank you. They all sound good but for today I'll choose the Spicy Garlic Chicken. I've been looking forward to trying this product, especially the Orange Chicken. The Sweet & Spicy Shrimp would be my first choice. i’d like them to add a Mandarin mixed vegetable Tofu flavor to their product line, and thank you for the chance! The Wanchai Ferry Beef and Broccoli is actually the one I'd like to try because all the rest of them have been tried by this family. However the ones with shrimp in them have to be eaten by other family members as I'm allergic to those. I usually make my own Asian Beef and Broccoli and yes I use American broccoli so it's not authentic to the max, but still really good. It would be nice to try Wanchai Ferry's and see if it is better than mine, which it probably is. You're welcome to cook Beef & Broccoli for me and I can let you know how it tastes. 😉 Mmmmmm. I would like try the sweet and spicy shrimp. I would like to try the Sweet and Sour Chicken. That is usually my favorite although the Orange Chicken sounds good too. The Beef and brocolli sounds fabulous! I'd like to try the Sweet and Sour Chicken. I would like the kung pao chicken. It sounds really good. I would like to try the orange chicken meal. The Orange Chicken would be my first choice, and then I'd work my way thru the rest! I would like a good General Tso's chicken. I would love to try the Orange Chicken and I think they should add General Tso chicken! I haven’t yet tried the frozen entrees but I do get the dry dinner kits all the time and they are easy and my whole family loves them! I'd like to try Orange Chicken, and I think they should add Vegetable Lo Mien. Yum! Orange Chicken looks good! The Orange Chicken I haven't tried. Looks great. Would love the beef and brocoli. Spicy Garlic chicken sounds good – I've tried Wanchai food before and it was good! My kids would go crazy for the orange chicken flavor. It's a nice way to try and sneak in some vegetables without them noticing. 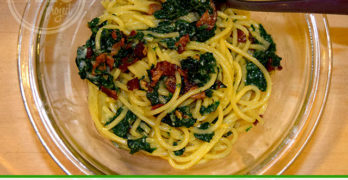 I'm always looking for quick and healthy dinner ideas and this looks like a winner! I would love to try the Orange Chicken. It sounds wonderful. I'd like to try the orange chicken. I'd love to try their Spicy Garlic chicken! I actually have tried the orange chicken and love it. I would like to try the Orange Chicken. Looks good! I think the spicy garlic chicken would be our favorite. They should add Hunan Beef! I would love to try the orange chicken variety, thanks! 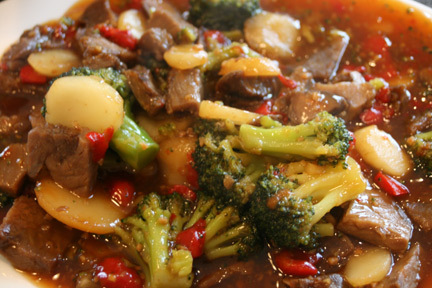 Beef & broccoli sounds fabulous! 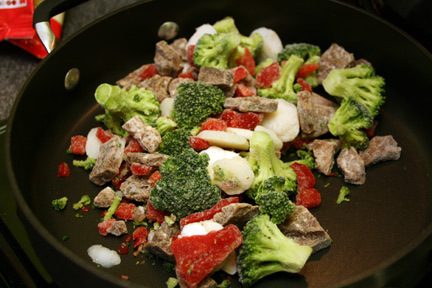 Beef & Broccoli is what I would love to try. My kids love broccoli! I would like to try the Orange Chicken! I would like to try the Sweet & Sour Chicken. I also wish that they carried a vegetarian option, such as veggies only or tofu. I'd like to try the Spicy Garlic Chicken – I like spicy foods a lot. Orange Chicken sounds like a good one to try out. I would love it if they made pad gui. The Orange Chicken looked fantastic. I think the orange chicken looks really good but so does the beef with broccoli. Orange Chicken Flavor sounds good. It would be nice to see egg rolls added to their line perhaps. I would love to try the Orange Chicken. Spicy Garlic Chicken sounds pretty tasty. I've tried their Spicy Garlic Chicken and it's very good. Pork Potstickers and pork fried rice. I would love to try the Kung Pao Chicken. I love Chinese food.